I was entering a potentially sticky situation at the end of last week. All four of my children were going to be home from school. Most of the time, on days off from school, my wife is home too. However, she had a teacher's in-service day. I was flying solo. A game plan was needed to help us reach the end of the day with smiles on our faces. Strangely, to avoid one sticky situation, I invented another sticky situation! 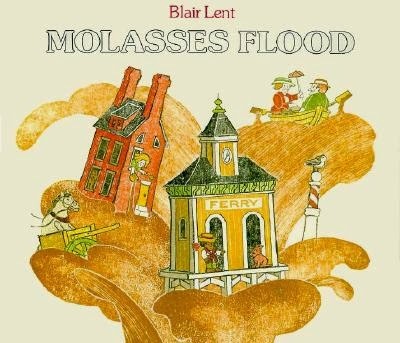 Over one year ago, I found Molasses Flood by Blair Lent at a used book sale. I immediately loved the book and hoped that one day I would create a memorable reading experience with my children after reading the book with them. But, I had doubts that it would actually happen. 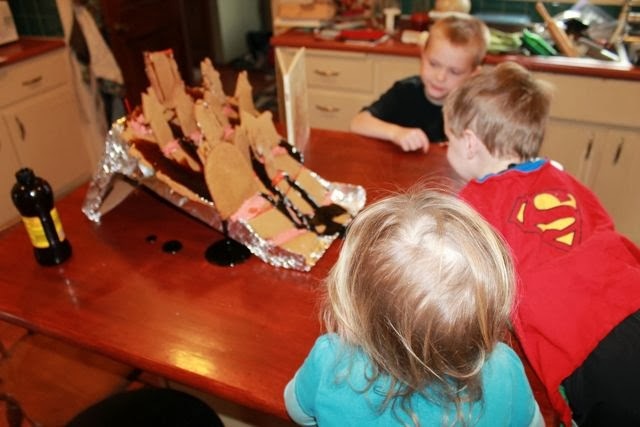 How would we recreate a book about an exploding tank of molasses that washes away Charley Owen Muldoon's house and fills the streets with sticky goo after a warm day in January? Upon reading the book to myself numerous times, I focused on the last lines of the book after all the molasses had been gathered up by Charley's family and by people from all over the city. But when meal after meal became baked beans cooked with molasses, molasses gingersnaps and gingerbread, molasses taffy, molasses cringles and cookies, Charley Muldoon grew tired of molasses. He didn't care if he ever saw any again. "Molasses cookies...." I thought. We could bake molasses cookies. However, I worried my children would feel the same way Charley Muldoon did and wouldn't care much for the cookies. So, I began thinking about Blair Lent's other books with hopes of being inspired with an idea for a birthday celebration activity. Blair Lent was awarded the Caldecott Medal in 1973 for The Funny Little Woman by Arlene Mosel and received three Caldecott Honors for The Angry Moon by William Sleator (1971), Why the Sun and Moon Live in the Sky by Elphinstone Dayrell (1969), and The Wave by Margaret Hodges (1965). Also, my children love his book Tikki Tikki Tembo by Arlene Mosel. I had many great books to choose from, but too many days went by without an activity idea. It was the night before my children were going to be off from school and I needed a plan. 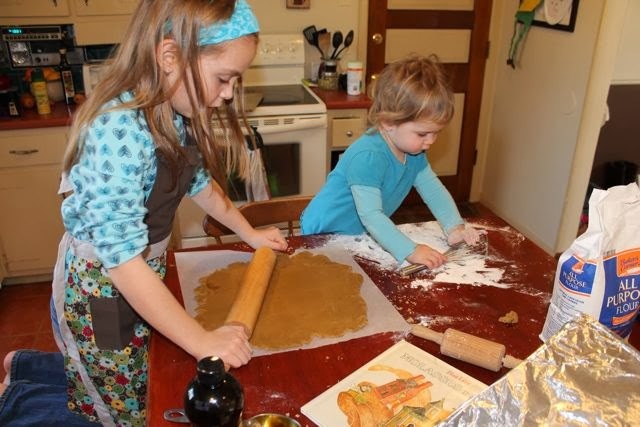 Therefore, I returned to Molasses Flood and the idea of baking molasses cookies. 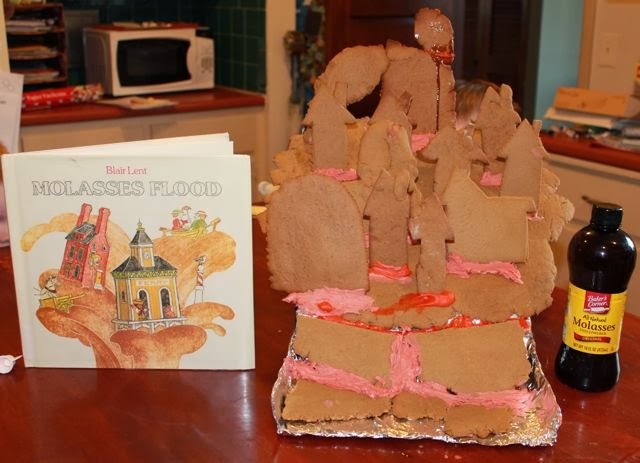 Then, I had an idea that I hoped would work...recreating the flood with molasses cookies! But, I needed the imagination of my children to make it happen. 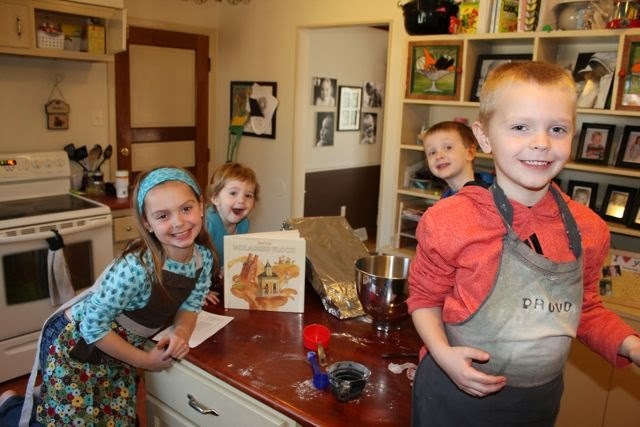 My baking crew was excited and energetic early in the morning for their challenge. 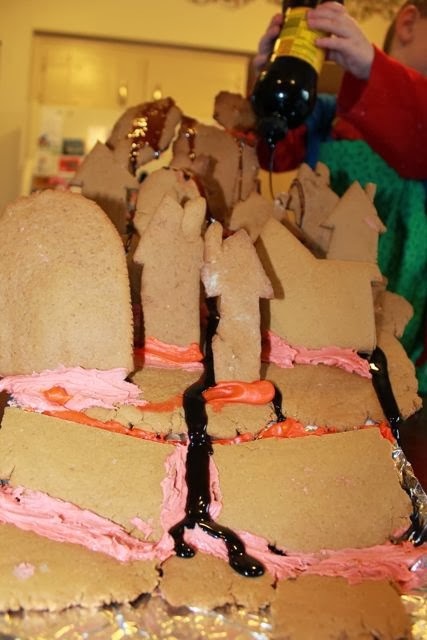 Our next batch of cookie dough was used to make the houses. 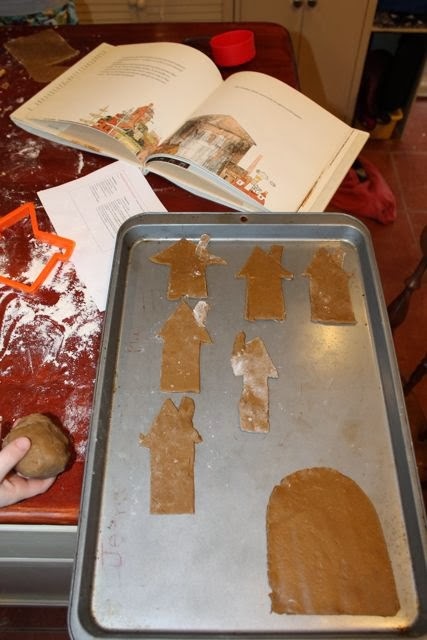 We used a haunted-house-cookie-cutter to guide us in making the houses look similar to the houses in Blair Lent's illustrations. 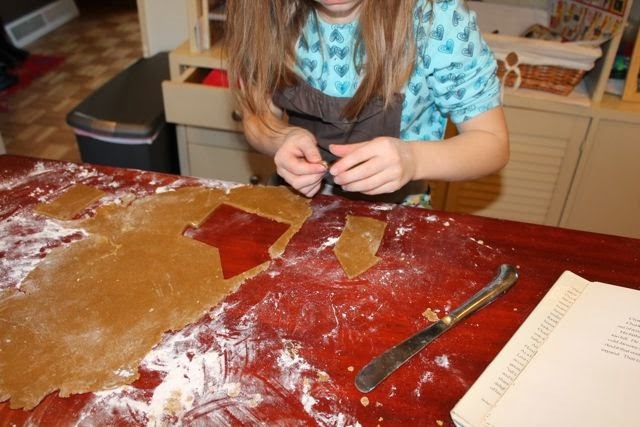 We found it beneficial to slightly press the cookie cutter into the dough. This gave us an outline of a house and then we used a knife to carve the exact shape we wanted. We also made sure each of the houses had chimneys. Most of the time we just squished the chimneys on after we cut out the house. We tried several molasses tanks too. The one pictured here at the bottom of the tray was not chosen as the exploding molasses tank, but was added later to the cityscape anyway. In Molasses Flood, the molasses flowed all the way UP to the State House. 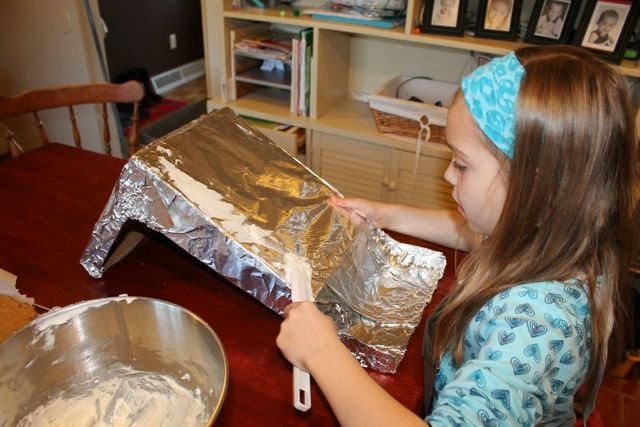 We weren't going to be able to recreate that, so we built a hill out of a cardboard box and covered it with foil. This would allow our molasses to flow DOWN. My daughter covered the hill with cookie frosting so our cookie wouldn't slip down the hill. 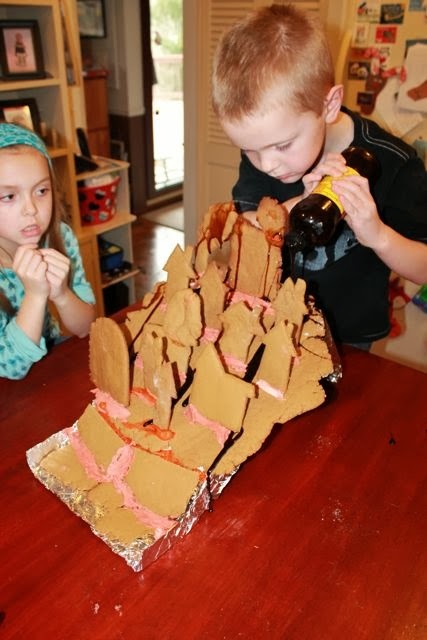 My son and I worked carefully to place our giant molasses cookie on the hill. It was time to build our city with the houses. 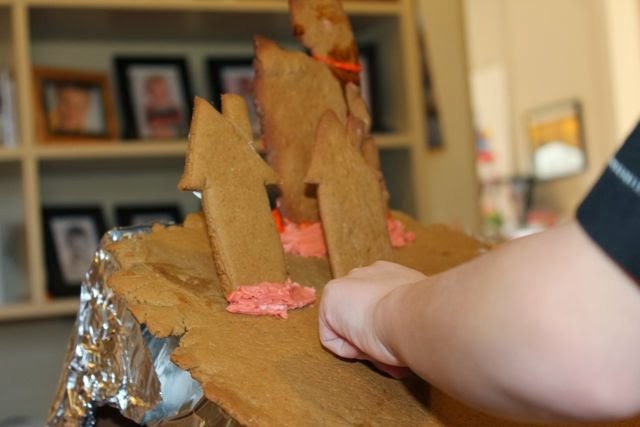 We used frosting and toothpicks to hold up the houses. 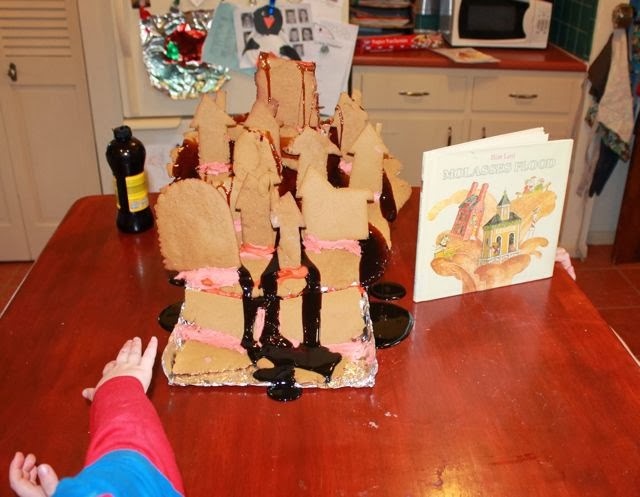 We made red frosting because the illustrations featured houses of red bricks. 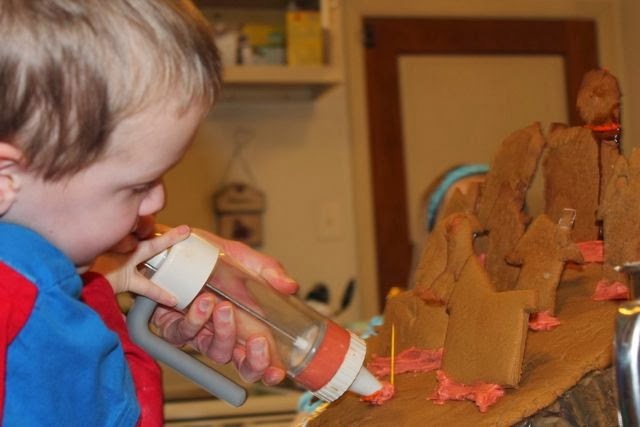 My children also insisted on using this frosting tool that we found in the cupboard! 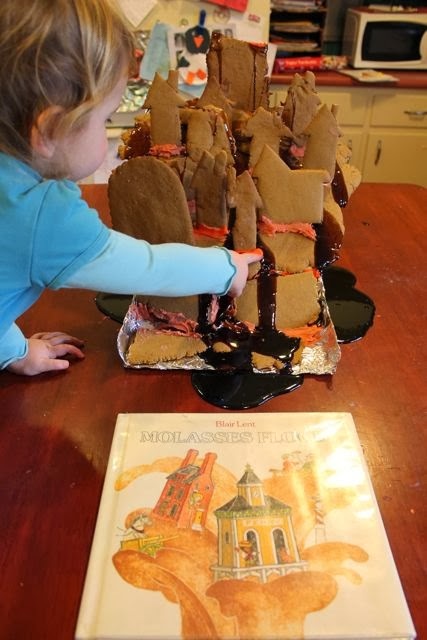 Our finished molasses cookie city. Blair Lent's mother told him stories of a tragic molasses flood in Boston that occurred in 1919. In the afterward of the book it states, "Once, a long time ago, a molasses tank did explode and molasses did flood a small part of the Boston waterfront. 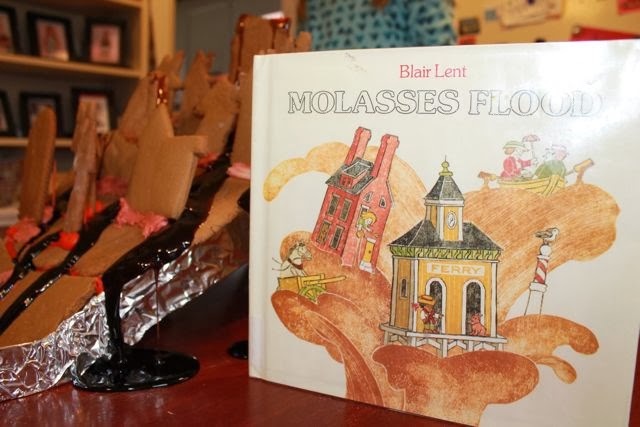 Molasses Flood is told, however, not as it really happened, but as Blair Lent imagined it whenever his mother, who grew up in Boston, would tell him about it." 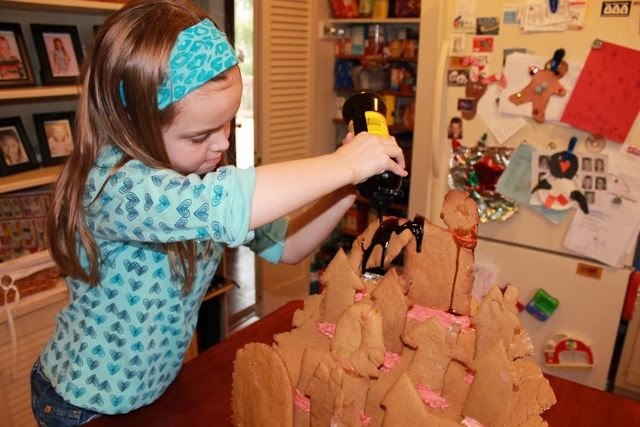 My daughter had the honors of covering her molasses cookie tank with oozing molasses. 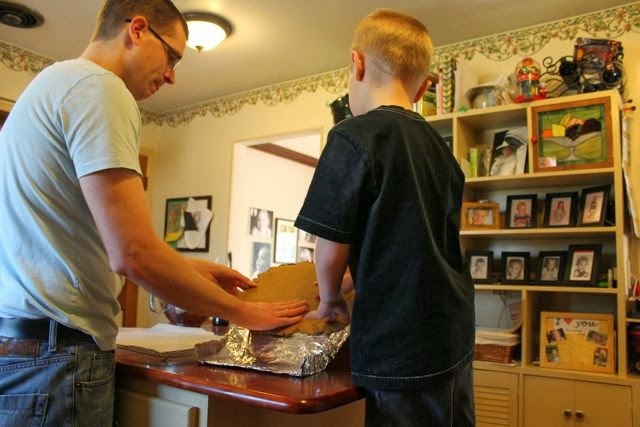 Next, it was my son's turn to squeeze the molasses. His sister looks on to make sure he is doing it right. He gave his younger brother a turn and slowly the molasses began to ooze through our city streets. What a mess and it sure smelled good! One last squeeze of the bottle and it was empty! Now it was time to watch the molasses flow! Not a bad way to spend a day off, avoid a "sticky situation" and end with everyone SMILING! I went to help the big kids wash their hands in the bathroom and I come back to my youngest daughter eating the frosting off the houses! 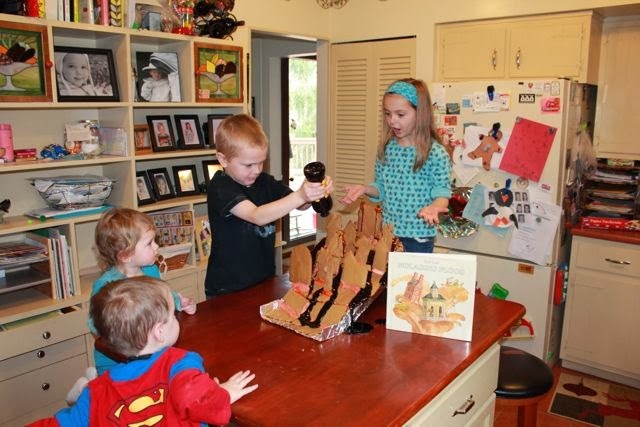 When Mom returned from work she found four happy children and a really messy kitchen at home! We eventually cleaned it up ourselves, but we wanted her to see how we spent a large part of our day together. She just shook her head, and said, "It looks like you guys had fun with Daddy today!" I thought, "I really had fun with my children today!" I want to thank the Mazza Museum of Findlay, Ohio for helping me confirm the date of Blair Lent's birthday. The Mazza Museum is one of my favorite places and I highly recommend a visit. It is the home of many pieces of art by Blair Lent. 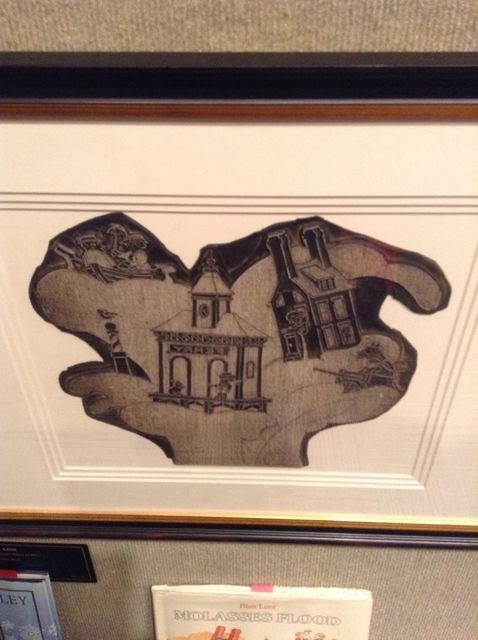 Here is a photo of the cardboard-cut that was used to make the illustration for the cover of Molasses Flood. Please "LIKE" the Mazza Museum on Facebook!